Throughout the New England Aquarium, there are many fashionable animals! Patterns of stripes and polka dots, shimmering scales, graceful fins and swatches of every color of the rainbow can be found in the many exhibits. And the fish that outdoes them all? The mandarinfish! Native to the tropical Western Pacific Ocean, the mandarinfish (Synchiropus splendidus) is found from southwestern Japan to Australia, inhabiting small inshore and protect coral reef systems. At the Aquarium, this fish can be found in the Tropical Gallery swimming among the living coral showing off his fantastic array of colors. With the mazelike combination of green, orange and blue that was said to evoke images of an Imperial Chinese mandarin (or bureaucrat), this fish is a fashion standout. As he moves around the exhibit, his fins move in a fan-like motion, making his fantastic colors stand out even more! Those impressive colors also have another meaning for other larger fish in the area. The mandarinfish can secrete toxic mucus designed to keep predators at bay. Those bright colors warn potential predators to stay away or you might get more than a mouthful. 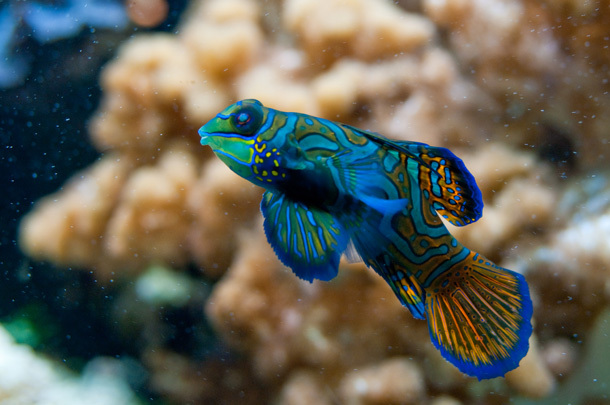 Though the Aquarium has had many different mandarinfish, they are hard to keep as pets in home aquaria. They require special food and care: fortunately, our husbandry staff are great at taking care of them. So come see some bright colors during the gray days of winter! 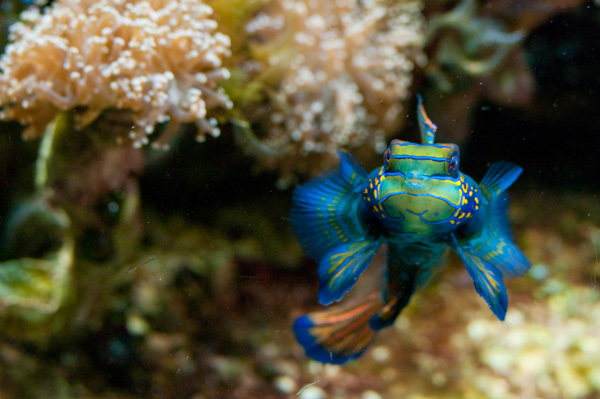 You can find another Mandarin fish at the aquarium. There is one in the living coral tank in the West Wing across from the Shark and Ray Touch Tank. 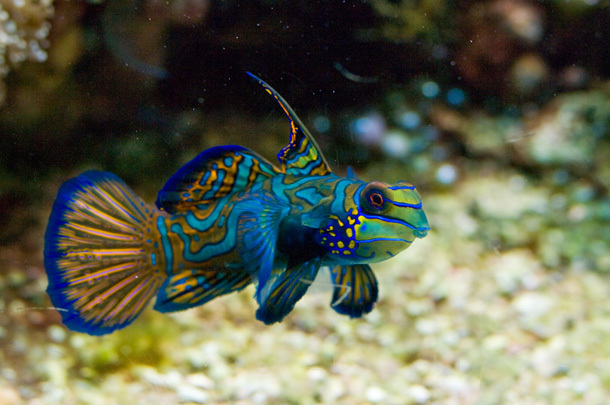 There is also a Dragonet in that tank that many think is a green version of the Mandarin fish.